So far Ashley Garcia has created 22 blog entries. Many FC alumni move on to bigger and better things, taking what they have learned from their years in high school and applying them to life in the real world. Very seldom do we discover that some of those alumni end up being in the spotlight. 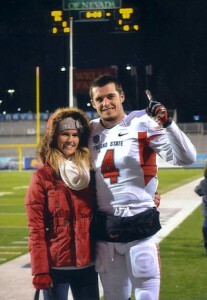 Former FC alumna Heather Carr graduated with the class of 2008, and went on to marry current NFL Oakland Raiders quarterback and former Fresno State quarterback Derek Carr. During high school, Heather (Neal, ’08) Carr discovered her passion for cheerleading, hoping to pursue it in college. However at the time she attended Fresno State, the cheerleading program did not exist due to the absence of a cheer coach. Carr majored in teaching, gaining her desire for teaching when she was in the fourth grade. Her inspiration for this was her mother, who was a fourth grade teacher, and who Carr would go watch intriguingly as she taught her students. Although she is still involved in spiritual mentoring, God led her on a different path from teaching when she met Derek. Heather Carr worked at Hollister at the start of her freshman year at Fresno State and later went on to work at BJ’s, where she encountered the newly discovered football star. After some time of dating and getting to know each other, Derek and Heather decided to take their relationship a step forward, marrying in 2012. 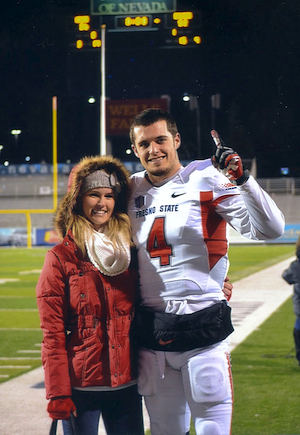 Being married to a football player in college was a fun experience to Heather Carr. In August of 2013, the Carr family added a new member: Dallas. Since Dallas was born at the beginning of football season, it made it difficult for Heather, being a married mom in college and Derek being away at practice, normally from 5-9 p.m.
“Derek knows exactly what he wants and what he needs to do, and he will get it done,” Heather said. “He took summer school before I even met him so that he could graduate, so he could just go play football. He had a plan, before he even got into college. All of the hard work and determination payed off in 2014, when Derek Carr was drafted to go play in the NFL for the Oakland Raiders. The lifestyle of Heather and Dallas Carr drastically changed with this new chapter in their lives. “It’s different in the NFL,” Heather said. “There is literally no phone conversation, no texting the whole day. He is gone from 4:30 a.m., to about 6 p.m., and we don’t hear from him all day. Then, he would come home at 6 p.m., we would eat dinner, an then he would study the playbook and watch film, so we really don’t get to see him all that much. Although the football season is tiring for Carr with Derek’s absence, the off season is a much needed reward for the family of three. Being a NFL wife, Carr loves the new experiences she gets to encounter. Born from a strong Christian family, Carr loves the opportunity to share with the other NFL wives the light of the Lord, something that is very important to her, and the family as well. Although there are many benefits of being a family member of an NFL player, there are also some hardships. The Carr family had a bit of a scare in August of 2013, when their son Dallas was born with intestinal malrotation, which is a blockage of the digestive tract due to the twisting of intestines, that prevents the proper passage of food. They found the problem approximately six hours after he was born, and they rushed him to Valley Children’s Hospital when they noticed he wouldn’t eat, and he kept throwing up. There, Dallas had his first of may surgeries at only ten hours old. Throughout this difficult time, Carr really relied on the Lord, and He did not disappoint. At this time, Derek was gone, because he was in football, so his trainer would call him off of the field, straight from practice, to let him know when Dallas was having another surgery,” Carr said. “So, it was really hard for both me and Derek. It was really hard for him to focus on football when his son was having surgery in the hospital. All of the obstacles they went through made them realize that they could handle anything, and that God was doing this for his glory. It was humbling to the Carr family that they got to share God’s love and light through Dallas’s story. Heather hopes to continue her love of teaching and help share Jesus’s light with many young adults, and in the mean time, will continue to enjoy time spent with her family, and living the life of the Raiders quarterback’s biggest fan. This writer can be reached via twitter: @ashhasthescoop. After leading the FCS cheer program from 1979-2004, Eunie McEntee and her husband Dave have traveled, volunteered at their church and loved on their many grandchildren. The adventure of life comes with many pleasant discoveries. Discoveries including places, people, ideas or even objects. The most important discoveries however, are the ones that change lives forever. In this case, that pleasant discovery for the FCS family was Eunie McEntee. McEntee started the campus cheerleading program in 1979, and has left a legacy ever since, despite her redirection in 2004. Not only did McEntee change the cheer program for the better, she also worked into students lives as well by educating them in Bible and PE. She was also very involved in drama and student activities, teaching leadership for a few years as well. 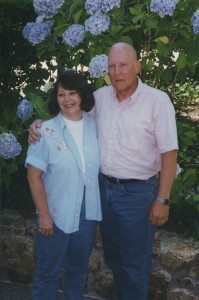 After many years at FC, McEntee took some time off to go to Belgium with her husband on a missionary trip in 2004. When she returned, she taught for one final semester at FC. Prior to being involved at FC, McEntee took her passion for gymnastics to Clovis High School, founding their gymnastics program in 1972. As a result of all of her hard work and the impact that she has made on countless numbers of lives, there will be given a $1,000 cheer scholarship in her name at the FC sport award banquet on Feb. 23. Upon McEntee discovering the news about the scholarship, she was very humbled, and wanted nothing more than to shine God’s light through this experience. McEntee thoroughly enjoyed her years as being the FC cheer coach. There are many different coaching techniques, however, McEntee was unique compared the the normalcy of other coaches. The reason being is that she based everything she did trusting in the Lord and made sure that her girls knew to do the same. “I think excellence can only be on the standard of what God’s word says. Gods word never changes. We live in a society where they say, ‘okay, here’s your belief, right here… and we move it according to times and changes but God’s truth just stays here. Yes, there will be changes, but God’s standard never changes, so excellence is just based on that,” McEntee said. These lessons went on to impact the lives of many, including Trisha Messer, a cheerleader of McEntee in 1987, and now an FC parent of Olivia and Courtney Messer. Yet another life she has made a tremendous difference in is former FC cheerleader Melanie Wright Swager. “Mrs. Mac is what we all called her, “Swager said. “She taught us about teamwork. She always said, ‘You’re only strongest as your weakest link,’ which meant we all had to work together, help each other and encourage each other. There is one person in particular that has been influenced greatly by McEntee and the person that she has become. Peggy Thompson, mother of Tricia Messer, and best friend of Eunie McEntee. McEntee and Thompson became friends 40 years ago, when they attended Evangelical Free Church, and also became closer while they were pregnant at the same time with their second born sons. Throughout this time, they have gotten to know each other inside and out, and Thompson could not be more grateful for the friendship they share. “Eunie is a great teacher whether in the classroom, teaching Bible Study or sitting at a table drinking coffee,” Thompson said. “When you are in her presence you are inspired by her high energy, her enthusiasm and love of learning and positive attitude. Being a cheer mom, as well as a close friend of McEntee, Thompson saw multiple sides of Eunie, all of which were the same, Godly woman. “Being a Godly woman and teacher doesn’t stop on the cheerleading floor, ” Thompson said. “She (McEntee) challenged the gals to be the best they could be in completing with hundreds of other cheerleaders, in the classroom, in friendships, in their walk with the Lord. Her reputation as a cheerleading coach influenced her cheerleaders in a positive aspect, along with her love and passion for the sport. The Eunie McEntee scholarship is seen as a deserving tribute, especially by former FC cheerleader Heather (Neal) Carr, ’08. “She was really encouraging,” Carr said. “Mrs. Mac is very upbeat and she shares her love with God with everyone with bible verses and she just makes you feel very encouraged about life. Thompson and McEntee shared a special bond, and have watched each theory grow as individuals. Seeing all of McEntee’s hard work pay off made Thompson proud to be her friend. The scholarship will be rewarded to a freshman, sophomore, or junior for the upcoming 2015-’16 cheer season. The winner of this award will be announced at the FC winter sports award banquet, Feb. 23 in Ground Zero at 7 p.m.
With all of McEntee’s involvement at FC during her coaching years, she wishes hopes to be more involved currently, doing anything she can to help out the Eagle community. 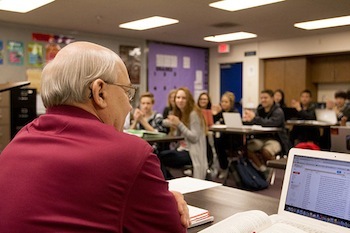 History teacher and photo-journalism adviser Kori Friesen, also an FC alumni, has been impacted by McEntee and her joyful presence in the years that she has known her. “Eunie was the joy of the school,” Friesen said. “She was the practical joker. You could hear her laugh all the way down the hallway. The teachers were a family because she was such an anchor. Having Mrs. Mac as a cheer coach was also always exciting. The FC community is encouraged to help honor Eunie McEntee and continue to support the FC cheer program and help a deserving cheerleader to receive scholarship monies. Eunie McEntee influenced the lives of many. She will always be a part of this FC family, and will be remembered for her Christ-like lifestyle, and outgoing personality. Please be sure to say thank you to her next time you see her–for shaping FC into what it is today. For more features, read the Feb. 20 article, Fresno hosts horror movie, to be released nationally. Not only is Nickerson a substitute teacher for FC, but she also subs for schools around Clovis Unified. Many people here on the FC campus make a tremendous impact. Among those people is Whitney Nickerson, substitute teacher at FC. Nickerson graduated from Buchanan High School with the class of 2008, and later went on to earn a degree from Fresno State in Animal science, specializing in Dairy Science. Nickerson has been working in place of junior high Bible teacher Matthew Weimer while he is home recuperating from a tragic loss. She has loved the opportunity so far and has learned a lot from the experience. Not only is Nickerson a substitute teacher for FC, but she also subs for schools around Clovis Unified. She aspires to become a teacher one day as well as running her own cow/calf operation at home. Working with cows is one of her dreams, and something she loves doing with her husband in her free time. Nickerson goes on to explain her interest in cattle and its roots in her family. Senior Justin Porter thoroughly enjoys Nickerson as a sub and appreciates what she does. One of her seventh grade first period Bible students, Lindsay Weimer, is very thankful for the time Nickerson has spent with the class. Matthew Weimer will return fourth quarter to relieve Nickerson of her substitute role. However, until then, The Feather staff encourages you to say thank you for all she has done! Follow the Feather via Instagram and Twitter: @thefeather and @thefeatheronline. This writer can be reached via Twitter: @ashhasthescoop. For more features, read the Feb. 4 article, Feather Highlights: Frame Rate. Prior to his move, Bennett worked at FC as principal for a number of five years after about 21 years of experience in education. As most know, many changes have arrived along with this 2014-15 school year. This includes the relocation of FC former principal, Todd Bennett. Prior to his move, Bennett worked at FC as principal for a number of five years after about 21 years of experience in education. Currently, he is the principal at Laurel Creek Elementary School in the Fairfield-Suisun Unified School District. Laurel Creek is a large K-6 school with 940 enrolled students. Garcia: How is Laurel Creek different from Fresno Christian? Bennett: Laurel Creek is much larger than FCS, and it only serves kindergarten through sixth grade. It is similar to other public schools where I have worked. The school is ethnically and culturally diverse. Our largest ethnic groups are Hispanic, African American, and White. Our students represent all religions, as do our teachers. Garcia: Do you miss FC? Bennett: Yes! 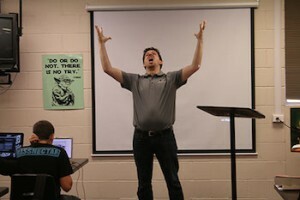 There are many things that I miss about Fresno Christian. I miss the students, faculty and staff. My family and I were so blessed to have spent five years in such a positive, faith-filled environment. The opportunity to focus on God’s Word every day at work, and to openly share my faith with students and colleagues was amazing. I am grateful that my children were able to graduate from such an outstanding school. Garcia: How has God blessed you throughout the past year? Bennett: The Lord has blessed my family and me in so many ways. I love my job, my wife is working at a small Christian school here in Fairfield, and my kids are both attending college up here. God has given me the opportunity to lead another great school, and be part of the lives of a new group of children. We are living in a great part of California. Fairfield is about mid-way between San Francisco and Sacramento. It takes about about an hour to get to either city. Garcia: Is there anything that has changed? Bennett: Moving to a new city, after a lifetime in Fresno, has been a pretty big change. My parents, sister, and closest friends are still in Fresno, so I don’t get to see them as often as I would like. Other than that, the changes have all been positive. It is exciting to take on new challenges and experiences. Garcia: Do you have any further career goals? Bennett: I love being a school site principal. I hope that I can have a positive influence on the students and with whom I work, and that I can serve my Lord and Savior wherever He calls me. 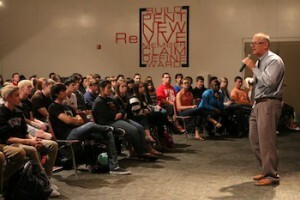 A previous article about Bennett, upon his arrival at Fresno Christian in 2009 can be read here. Follow The Feather via Twitter @thefeather and Instagram @thefeatheronline. This writer can be reached via twitter: @ashhasthescoop. For more features, read the Feb. 2 article, Alumnus takes talents to professional level. Students put away their selfish habits for a week of Random Acts of Kindness. Imagine a world without kindness. A world where there was not a caring person, or anybody who had the simplicity to make someone feel loved. That is a world I do not want to live in. Random Acts of Kindness Week is Feb. 8-15 and we need to start the awareness now. We need to admit our self-centeredness, put it aside and find simple ways to change that pretense. The Feather Online and student leadership are piggy-backing on The Great Kindness Challenge. In the weeks leading up to Valentine’s Day (Feb. 14) and #RAKweek2015 (Feb. 8-15), students should take into account to be kind to others, and change the world for the better. Often, we go about our everyday lives, forgetting to acknowledge the people around us, because of that fact that we are already wrapped up in our own problems. The Great Kindness Challenge, if you choose to accept it, will hopefully bring out the greatness in you, because we all know there is greatness in all of us, we just have to dig deep enough to find it. There are many ways to participate, some of which include simple, kind gestures such as giving a compliment to five people per day, make a new friend, bring a flower to the office staff, or offer to help a custodian. With that being said, as Random Acts of Kindness Week approaches, I encourage all of you to take the Great Kindness Challenge, find the greatness within yourselves, and help to make this world a better, kinder place. Student leadership will be posting a poster on the downstairs hallway this week. Please take the time to add your name and take the Great Kindness Challenge. Be responsible, respectful and accountable to be kind these next two weeks and beyond. As someone to partner with to write out ways you will be selfless this month. Additionally, students will have an opportunity to serve and show kindness Feb. 19. The high school students will be off campus to engage with the community and help with graffiti removal, Neighborhood Thrift, the Poverello House and others. Additionally, please post your challenges to others via The Feather comments at the bottom of this article or Twitter: #RAKweek2015. Follow The Feather via Twitter and Instagram: @thefeather and @thefeatheronlilne. This writer can be reached via Twitter: @ashhasthescoop. For more opinions, read the Feb. 1 article, Super Bowl XLIX blog: Roggenstein in Phoenix. The Feather Online and student leadership are piggy-backing on The Great Kindness Challenge and also encouraging Random Acts of Kindness Week, Feb. 8-15. The Feather Online and student leadership are piggy-backing on The Great Kindness Challenge. In the weeks leading up to Valentine’s Day (Feb. 14) and FCS Serve Day, Feb. 19, students should take into account to be kind to others, and change the world for the better. Often, we go about our everyday lives, forgetting to acknowledge the people around us, because of that fact that we are already wrapped up in our own problems. Student leadership will be posting a poster on the downstairs hallway this week. Please take the time to add your name and take the Great Kindness Challenge. Be responsible, respectful and accountable to be kind these next two weeks and beyond. As someone to partner with to write out ways you will be selfless this month and take the kindness challenge. Additionally, students will have an opportunity to serve and show kindness, Feb. 19. The high school students will be off campus to engage with the community and help with graffiti removal, Neighborhood Thrift, the Poverello House and others. The Feather staff will update this article throughout the month of January as individuals send in responses to join the discussion. Please check back multiple times per week to read the additional comments. January: the first month of the year; the month of new beginnings, fresh starts, new years resolutions and also the national month of thank you. The words, “thank you,” are words that can go a long way in someones heart, however, they can be extremely underused. January is a perfect way to start off the new year, and show the people that invest in our everyday lives that we are grateful, and what they do for us matters. Often, we go about caught up in our days not realizing the impact people around us have on our lives. People such as parents, teachers, mentors, police officers, janitors and encouraging friends. January is the month where we can give back, and let those people know that we are thankful for them. “Thank you” are not only words that let people know we are grateful, but also an expression of gratitude that can not only lift up the people around us, but also make ourselves feel proud, relieved and remembered. There are ways that us as students can let those people around us know how thankful we are. We can make someones day this month by simply writing a thank you note, and letting people know we are grateful and appreciative of the things they do for us, and how they have made a difference in our lives. We can also give a compliment to someone. Believe it or not, when someone is having a bad day, or feeling like their work is not being acknowledged, a compliment can go a long way to boost their confidence, and their whole day. Some students have shared stories of people who have made an impact in their lives, or have shared ways that they will try to show their gratitude towards others. The Feather staff encourages students to submit their stories, opinions, or ideas in the comment section, and let us know how they will make a difference in someones life this January. Please use the hashtag, #TogetherWeAdvance in your Twitter and Instagram posts this month. For more features, read the Jan. 6 article, Holiday season highlights: Join the Discussion. With the beginning of January being the first week back from a much needed vacation, what better way to celebrate than National Bubble Day. On Thurs., Jan. 8, FC student leadership will be celebrating National Bubble Day by distributing small bottles of bubbles to the student body. At lunch time, students will be able to blow the bubbles in camaraderie with one another. Not only is Jan. 8 National Bubble Day, but it is also national Argyle Day, Earth Rotation Day, Joy Germ Day and National Show and Tell at Work Day. Vickey Belmont, student leadership advisor, explains the background of this unique national day. According to nationaldaycalendar.com, National Bubble Bath Day is an unofficial national holiday for the reason being that they were not able to find the creator of National Bubble Bath Day. However, it is celebrated because it is found that one of the most relaxing things to do on a typical winter day is to relax in a quiet and calm bubble bath, therefore it was made a day dedicated to bubble baths. It is also a fact that the bubbles on top of the water (also known as foam bath or foaming bath) insulate the bath water, keeping it warmer for a longer period of time. Senior Breanna Jennings, expresses her opinion of this upcoming Thurs. “I think it is really strange that they made a national day dedicated to bubble baths, but since we are getting free bubbles at school, I think it is going to be really fun and interesting,” Jennings said. National Bubble day is not the only strange day on Thurs., Jan. 8. It is also National JoyGerm Day, which is a comical way of saying “spread the joy,” since germs spread very easily. “National JoyGerm Day was created as a day to remind people across the country that by being positive and treating people with kindness they can influence those around them and pass that positiveness on to others, impacting the lives of people and even those that we do not even have direct contact with,” according to nationaldaycalendar.com. With that being said, The Feather staff not only invites you to blow bubbles with us this upcoming Thurs., but we also encouraging you to spread those joyful germs, and be the best version of yourself on this day! For more news, read the Dec. 15 article, BRIEF: Feather staff breaks for holiday, returns Jan. 5, 2015. The tradition continues for the 15th year in a row, as Sharon Scharf’s home economics class constructs a 9-foot burrito. The burrito contains the usual ingredients including beans, meat, lettuce, tomatoes, salsa, cheese and olives. Scharf received the recipe of this traditional Mexican dish from LaVictoria food company. In past years, the food company sent out recipes to cooking classes, and had them test the recipe to see of it turned out as they had planned. Scarf received the recipes and introduced them to her class, including the 9-foot burrito. After La Victoria cut their recipe program short, Scharf continued the 9-foot burrito activity. “We’ve been making this burrito for 15 years now,” Scharf said. “It all started when my neighbor, who was teaching home ec. at Reedley High, alerted me to a program that La Victoria Foods had for high school home ec. classes. They would send us their recipes and their products in turn for an evaluation of said recipes. The first step of constructing the 9-foot burrito is preparation. The students set up a 12 ft. by 12 in. board on a clear surface, and covered it with aluminum foil. While the tortillas were warming up in the oven, other students were cooking the beans and meat on the stove. The condiments were being chopped up into small, intricate pieces by the remaining students. Afterwards, the students transferred the ingredients onto the tortillas, which were placed on the board. 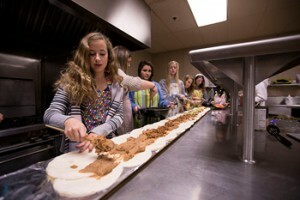 Following that step, the students all lined up alongside of the burrito, and folded it over simultaneously. Hence, the 9-foot burrito was finished. Junior Courtney Messer, who was a student in home ec. last year, enjoyed participating in the making of the burrito. This year’s burrito did not fall short of the previous one. Sophomore Brookyln Ainley was not disappointed with the outcome of the burrito. Gloria Xu, ’18, enjoyed the way the burrito turned out. Freshman Matthew Oliver explains the ingredients and process to making the 9 ft. burrito. 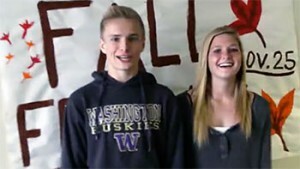 Freshmen Riley Endicott and Olivia Messer ham it up to get students to sign up for the Nov. 25 Fall Festivus. After the success of last year’s Fall Festivus, student leadership has decided that the tradition of this much anticipated event must proceed to happen again. The second annual Fall Festivus will be held, Nov. 25, the day before Thanksgiving break. The Fall Festivus will again be held at the Beal residence, starting at 6:30 p.m. and will end at 10:30 p.m. With last year hosting roughly 70 people, student leadership expects approximately 60-70 people to attend this year. 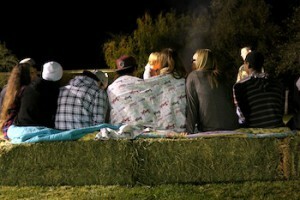 The night will consist of movies, dinner, s’mores, bonfires, dessert, and lots of Fresno Christian fellowship. Having attended the Fall Festivus last year, Justin Porter, ’15, enjoyed the overall aroma of the event, and is anticipating the upcoming one. With this year only being the second year having the Fall Festivus, freshman Roman Endicott is highly awaiting what the night has to offer. However, do not take these students’ word for it. There are 70 others who went last year. Talk it up. Find out for yourself. But plan on being there. The entrance fee is $10, and must be paid by Nov. 24. For more news, read the Nov. 19 article, Food drive donates, makes difference in community. With weeks of thought the decision has been made that the 2015, 23rd annual Night of the Stars will be held at Wolf Lakes. Movies, elegant dinner, dessert, photo booth, grammy awards and lots of pictures: also known as FC’s Night of the Stars, the most anticipated event of the year. For the past years, FC has confided in The Grand 1401 to hold the annual NOTS event, however this year, student leadership decided to go in a new direction. With weeks of thought the decision has been made that the 2015, 23rd annual Night of the Stars will be held at Wolf Lakes. Normally, NOTS is held in mid Feb., however, due to the change in venue, it will now be held, March 28. Wolf Lakes is a park, privately owned and located near the foothills of Clovis. Both of the two formal locations are alongside the lake. As a result, there will be lake cruises for the students during the night, which is included in the price of the ticket. This year, the cost per ticket will be suspected to be between $50-60. This price includes a variety of different benefits including set-up/clean-up, tables and chairs, linen tablecloths and napkins, china/stemware/flatware, service staff, appetizers, full catered dinner, lake cruises and security throughout the night. Normally, NOTS at The Grand 1401 would be an evening of going up and down elevators to take pictures, and a crammed space on the top floor of the building to socialize with friends. Student leadership advisor Vickey Belmont, gives insight into the decision for changing NOTS venues. Having attended NOTS last year as a freshman, Brooklyn Ainley, ’17, is anticipating the change of venue. “I’m excited because it looks a lot prettier, and there will be a lot more room to move around,” Ainley said. Erin Wilson, ’18, is expecting to be experiencing NOTS for the first time this year, and moving the location makes her excitement heighten. “I think NOTS is one of the most anticipated events, especially as a freshman. I’ve never been to NOTS before, so I don’t know much about The Grand 1401, but from what I’ve heard, it’s always been kind of compacted, whereas at Wolf Lakes, you can be outside with the flowers, and the lake, so I’m very excited,” Wilson said. 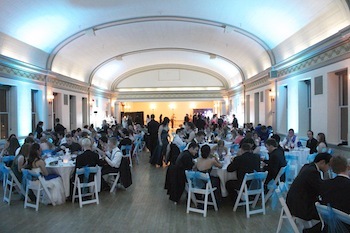 Save the date for the 2015 Night of the Stars, March 28, from 5:30-11 p.m. Follow The Feather on Twitter: @thefeather. This writer can be reached via Twitter: @ashhasthescoop. For more news, read the Nov. 20 article, BRIEF: Fall Festivus, Nov. 25. As Thanksgiving break approaches, students and staff share their traditions that make the holiday special for them. With the end of the semester approaching, students get one more break until finals and the new year. During the Thanksgiving season, the campus will break for a three-day vacation, Nov. 26-28. 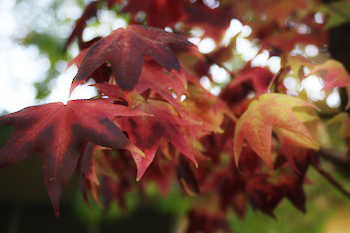 As the colder weather starts to arrive and the leaves begin to fall, campus clothes change from shorts to pants and t-shirts to coats. Many look forward to several holiday traditions like a Thanksgiving family dinner or watching the Macy’s Thanksgiving Day Parade. Some students shared their crazy family memories, their favorite foods or even what the holiday means to them in this video. Other students have left comments below or stopped by the journalism lab to share their favorite Thanksgiving memories. The Feather wants to encourage students to submit their opinions in the comment section on their favorite moments during the season or even their favorite holiday foods. Please take the time read the comments and type in your own Thanksgiving most embarrassing moments, favorite meals or best Thanksgiving memories below. These will be updated numerous times before Thanksgiving. For more features, read the Nov. 19 article Featured App: goREACT, Molecules, VSB Chemistry. Front page photo provided by Creative Commons 3.0 Flickr Tim Sackton. High school students gather before Thanksgiving Break to roast marshmallows and enjoy a cup of hot chocolate at the annual Fall Festivus, Nov. 25. The second annual Fall Festivus will be held on Tues., Nov. 25, the day before Thanksgiving break. After the success of last year’s Festivus, student leadership has decided that the tradition of this much anticipated event must proceed to happen again. The entrance fee is $10, and must be paid by Nov. 21. Follow the Feather via Twitter and Instagram: @thefeather and @thefeatheronline. This writer can be reached via Twitter: @ashgarcia. “Square Heart Shops is a non profit that I started last year, and we ask people to de-clutter their craft closets, and donate things to us, and then we repurpose it and sell it,” Markarian said. Both non profit, and direct sale booths were there, as well as simple homemade baked goods booths. One of the most popular groups was the Haitian bead project, started in the summer of 2011 by Mr. Ericlee Gilmore, and his wife Dorina Lazo Gilmore. Although the turnout was not what Markarian was hoping, she felt that it was a very successful for a first time event. More of the shops that were there was Perfectly posh, Gold Canyon Candles, Origami Owl and Jamberry Nails. Each booth pays a fee of $25 for a 10 ft. by 10 ft. space. Breanna Jennings, ’15, wished she had attended the “Eagles Shop A Lot Holiday Boutique” due to the variety of different vendors that were there. Markarian hopes that the next “Shop A Lot” Boutique will be held during the spring, around Mothers Day. Follow The Feather on Twitter and Instagram: @thefeather and @thefeatheronline. This writer can be reached via Twitter: @ashhasthescoop. It’s that time of year again, and the homecoming festivities are underway. 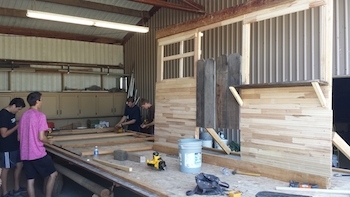 One of the most anticipated activities of the season is the float building. This year, with the theme being “A walk down Hollywood Boulevard,” each of the class floats will be based on a movie genre. Freshman will be sci-fi, sophomores will be 1940’s mobsters and the juniors will be the roaring twenties. This year, as their last float, the seniors will take on the western genre. Jordan Castro, ’15 shares his excitement about this years western float. For their freshman year, with the theme of boardgames, the seniors took on The Game of Life, receiving third place for their efforts. Sophomore year, the theme was Fairytales, and their float theme was Wizard of Oz. The class of 2015 received third place, yet again. Last year, the theme was super heroes, and their float theme was The Avengers. For the third year in a row, they received third place. Justin Porter, ’15, is ecstatic about this years float, and has high hopes for the outcome. During advisory, Sept. 18, the seniors had the first pick of float theme, they came together and voted on western. Due to the fact that it was said to be the most cost efficient, the seniors thought that western would be a perfect idea for their float. The basic portrayal of the float will display a town front along with a fake shoot out involving nerf guns. A saloon, and a little bar serving root beer floats with popcorn, will be set up to go along with the western-theme. The layout of the float was a conglomeration of the student who had the will and desire to be at the float meetings. With only three float meetings under their belt, the seniors have managed to complete almost 90 percent of their float, putting them above the other classes progress wise. Senior Jason Swain, head director of the float, explains how the the float came together. At this point, the seniors were working at a feverish pace, making this the fastest progress over the past years. The meetings have been located at the Beal household, from the courtesy of Trevor Beal, ’15, and his family. The 40 ft. trailer was graciously loaned to the class of 2015 by the DeGroot family. Be sure to attend the Homecoming game, Oct. 31. Follow The Feather via Twitter: @thefeather. This writer can be reached via Twitter: @ashhasthescoop. Also, please be sure to check out the Eagles’ schedule for the upcoming season at Max Preps. FC is currently 12-7 overall and 0-2 in the Central Sierra League as of Oct. 9. FC’s next game will be on Oct. 9, as the Eagles play a home game against Minarets High School. 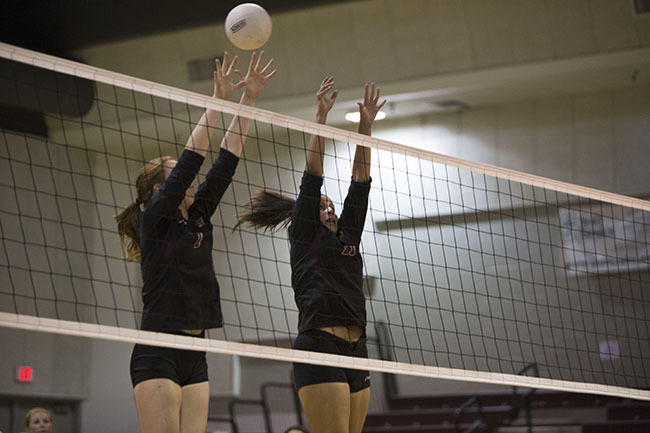 The Eagles hosted their rivals, The Fowler Redcats, in their first league home game and faced defeat, Oct. 9. The Eagles held their ground with a short lead throughout the whole first match until the last few points when the Redcats made a comeback and won, 23-25. Head coach Jonathan Penberthy shares his thoughts about the first match. The Eagles fought hard in the second match, however they were not able to pull through. Starting off the lead with 5-2, however loosing it yet again, 23-15. The third match was a tough fight for the eagles as well, however the Redcats finished off the eagles, and beat FC 25-19, ending the overall game, 3-0. Olivia Quebe, ’16, with nine total kills throughout the game, displays her excitement. The Eagles next home game is Thursday, Oct. 16, at 5:30 pm, against the Parlier Raiders. Adoption is a part of multiple student and family lives here in the FC community. Although adoption is not uncommon, most are unaware of the process and stories of those families. The emotional and spiritual journey of adoption is a major passion for Allyson, FC alumnus ’93, and Ryan Howard, parents of Taylor Howard, ’15. Taylor’s family is made up of 3 biological and 4 adopted children, so he has first-hand experience with adoption. In 2004, the Howards made the decision to adopt from Russia. A year later, they returned home with a son, Noah. Since then, they have adopted Samuel from Russia (2008), Zachary through Fresno County foster care (2010), and then Ivy Grace in December (2012) from China. Although adoption is a tedious process, Allyson, shares her immense gratitude towards Christ and the blessings he has given her family. Having a diverse family comes with struggles and hardships. Some adopted children struggle with loneliness, belonging or frustration. These struggles are a part of life, however that has not stopped the Howards from glorifying God or looking at this blessing in any different way. Allyson believes God will be faithful and sanctify her children through their new experiences. Curiosity is something that adopted children go through at one point in their life. They wonder why they are different, wanting to know their unique story, and how they came to be. This does not mean they are alone, they just have different circumstances and find it within themselves to figure out what to do with those circumstances to make themselves unique. Throughout the self discovery process, Allyson seen that they have learned about the power of love, and the true meaning of family. Allyson sees her children transforming into believers of Christ through their transition into a new family. PE coach and co-athletic director Mick Fuller, also an adoptive father of two children, Charles Emmanuel (13) and Lillian Rose (12), views his adoption journey with humility, and a great appreciation towards Christ. 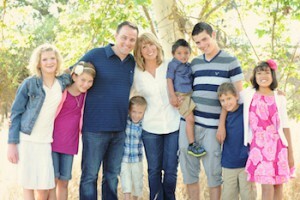 Fuller explains how God lead him into adoption and uses Gods teachings to raise his children. Nicholas Morrison, ’15, shares his and his twin brothers’, Rick Morrison, ’15, adoption story, and their gratitude of the process. Ryan and Allyson Howard are a part of the leadership team for Hope Found, the Adoption, Foster Care and Orphan Care ministry at Campus Bible Church. With founding help from Ryan, their goal is to raise awareness of foster children around the world, and to exemplify the love and grace God has given them by making those children His through adoption. This writer can be reached via Twitter: @ashhasthescoop. Follow The Feather via Twitter: @thefeather. For more features, read the Oct. 9 article, Woodshop allows students to explore artistic ability, talent. Prior to his procedure, Garza will have to endure two weeks of radiation, and if all goes well, he will carry through with the procedure late October or early November. This is a follow up of the previous BeTheMatch. For more information on Garza, read the Sept. 15 article, BeTheMatch: Stand for more (VIDEO). Central High head football coach Justin Garza, battling Hodgkins Lymphoma since Jan. 2011, has been in search for numerous months of a bone marrow donor to save his life. With multiple bone marrow drives in his name, and tremendous efforts to spread the word about BeTheMatch, Garza’s prayers have been answered: he has found a match. Garza will be on his way to Stanford Medical Center this Friday for a 90-day transplant process. Prior to his procedure, Garza will have to endure two weeks of radiation, and if all goes well, he will carry through with the procedure late October or early November. After the transplant, he will have to stay and live in Stanford under direct doctor care for three months. Childhood friend and bone marrow drive coordinator Tosha Giuffrida is filled with many emotions knowing they are headed in the right direction. Although Garza has found a match, the strong willingness to raise awareness of people in need of bone marrow donors will not stop here. Prayers for not only Garza, but also his anonymous donor would be greatly appreciated. For more information about Justin Garza, check out the Fresno Bee article, Prep football: Central’s Garza sees cancer fight hit higher risk level. ASB officials from each of the seven schools in the WSL get together monthly to discuss upcoming events and brainstorm ideas. As several well anticipated major school events are right around the corner, leadership classes around the West Sequoia League (WSL) put their minds together to make this year’s events worth the wait. 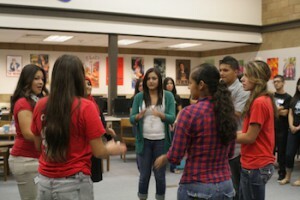 Events such as homecoming, NOTS and Sadies were the main topics at the most recent WSL meeting on Sept. 22, held and lead by Fowler High School. Each year, ASB officials from each of the seven schools in the WSL get together monthly to discuss upcoming events and brainstorm ideas. Not only do the schools learn about new ideas for school events, but they also come together to learn about each other. These meetings are a time where leaders can get together and bond so that they will get a better idea of how their school works, and gain a different respect for one another. The first meeting is especially crucial for the start of the year. Senior Danya Diaz, from Mendota High School enjoyed the previous meeting because it planted new ideas that she will carry on to her leadership class. Each school alternates hosting the meeting at their high school each time we meet. The high schools that attend these meetings include Caruthers, Dos Palos, Mendota, Tranquillity, Riverdale, Fowler, Firebaugh, and FCS. Hosted at Fowler, Senior Activities director Chandler Collins, put this meeting on with her fellow leadership class last minute, but was very satisfied with the outcome. The next meeting will be held at Mendota High School, on Nov. 17. BeTheMatch is a nonprofit organization which signs people up to be on the marrow registry. Cancer is one of the highest causes of death in the world. Most people would do anything to save the lives of their loved ones, or even themselves. This is where BeTheMatch comes in. BeTheMatch is a nonprofit organization which signs people up to be on the marrow registry and save the life of someone who has leukemia lymphoma and needs a bone marrow transplant to save their life. 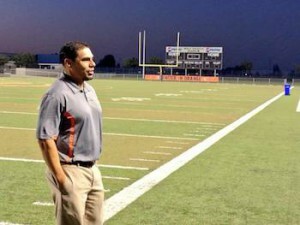 Central High School head football coach Justin Garza, (39) is battling Hodgkin’s lymphoma, a form of leukemia. He is partnering up with BeTheMatch to try and find a donor to save his life. Garza’s wife, Regina Garza, and one son, Joaquin, are the two things that keep him motivated to keep going strong. Regina expresses her hopes that her son will view his father’s illness as a learning experience, and will encourage him to grow stronger. “I want my son to know that his father handled adversity with courage so when he becomes a man, he will do the same,” Garza said. Before starting all of the Bone Marrow drives, Garza and his team wanted to set a goal for how many swabs they would get on the registry. Statistically, for every 500 people who sign up, one person would be a marrow donor. Although Garza has been through many obstacles over the years, he still seems to find ways to dwell on the positive aspects of it. Childhood friend of Garza, Tosha Giuffrida, was willing to do anything to help when she heard about Garza’s desire to spread the word about BeTheMatch. Giuffrida is now the coordinator of all of the BeTheMatch marrow drives. Coordinating all of the drives has opened Giuffrida’s eyes to new experiences and ideas. Looking at Garza and his family from the outside, and watching them come together, has shown Giuffrida that they are all strong people who have raised great people. Garza’s uncle, Gene Chandler, is entirely grateful for all everybody is doing for his nephew. Raising awareness for finding a match has been rewarding in many ways for Garza, Giuffrida, and the BeTheMatch crew. The importance of the whole process has been passionately stated by Giuffrida. The goal of raising awareness for BeTheMatch is not only to find a match for Justin and save his life, but also to save the lives of others. Giuffrida has spent numerous hours coordinating all of the drives, and as a result, she has personally learned that this process is not only helping Justin, but also helping her. Signing up for the registry is typically thought to be a painful process, however it is only a cheek swab. A simple cheek swab to save a life. Sept. 12: Selma High School at 11 a.m.
Sept. 12: Washington Academic Middle school at 4 p.m.
Sept. 12: Liberty High School at 5 p.m.
Sept. 12: Selma High School at 5:30 p.m.
Sept. 16: Fresno State University at 4:30 p.m.
Sept. 17: Fresno State Universityat 10:30 a.m.
Sept. 18: Fresno State Universityat 10:30 a.m.
Sept. 23: Kerman High School at 1 p.m.
Sept. 26: Madera County Department of Social Services at 10 a.m.
Oct. 3: Hanford High School at 5 p.m.
Oct. 23: McLane High School at 4 p.m.
Oct. 31: Hoover High School at 4 p.m.
You can sign up for the national bone marrow registry and save a life at Bethematch or visit a Central California Blood Center location to join the marrow registry in his name. Follow The Feather via Twitter @thefeather. This writer can be reached on twitter @ashhasthescoop. For more features, read the Sept. 11, Public commemorates 9/11 tragedy (VIDEO). Kyle Dodson joins the FC community as the new freshman and junior English teacher. The FC family welcomed many new members this year, including Kyle Grant Dodson: freshman and junior English teacher, and high school bible teacher. This is Dodson’s fifth year of teaching, previously coming from Sanger High also as a freshman English teacher, and a long term substitute for different schools around Clovis Unified. Dodson was born and raised in Fresno, California, along with his older sister Jessica. Fresno was where Dodson discovered his love for teaching, English and theater. He graduated from Buchannan High School, class of ?06, where he met his high school sweetheart; they have now been married for 1 year and 3 months. After high school, Dodson went to Fresno State University, and graduated with a major in English Education and an emphasis in theater. Growing up, Dodson always knew he wanted to be an English teacher, and was inspired to pursue that dream by past experiences in the classroom. He was taught memorable lessons by two inspiring teachers in particular that later helped shape him into the teacher he is today. With it’s small school setting, FC has turned out to be the place to make that happen. Dodson is very grateful for the opportunity. Being around a public school setting his whole life made the transition to FC very rewarding, sharing his favorite characteristics about the school. Although Dodson loves English and has a passion for it, a hobby that has also been tremendous part of his life is theater. He participated in theater all throughout high school and hopes to have it be a part of his future career goals. Junior Maddie Luginbill, enjoys her English class with Dodson because of his energetic teaching style. Alexis Cowan, ’16, enjoys the fact that Dodson is a younger teacher and the way he communicates with his students in the classroom. For more features, read Aug. 21 article: Brother to Brother program offers mentorship, togetherness..